Never expected another chance to see Black Sabbath live - let alone in Singapore. But this last weekend, they stormed Fort Canning Park for a huge crowd. Although the band I saw (Ronnie James Dio, Tony Iommi, Geezer Butler, Vinny Appice) go under the Heaven and Hell name to distinguish from the Ozzy version of the band, this is classic Sabbath. As good or better than a flashback to the Live Evil tour. I don't think Singapore will see such a brilliant live act for a long time yet. 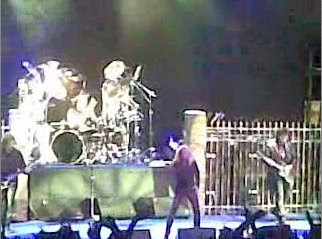 Flawless playing by all, Iommi just magic, Dio as good as ever .. I think they blew the doors of the clubroom at the back of the park. And the crowd loved it. Any hard rock act that thinks Singapore isn't worth the effort betta check with Dio or Megadeth (who played the night before). Here's my crap concert photo. I took some video too, but the audio track is useless -the band was pumping out about 100,000 watts too much power for my poor handphone mike! 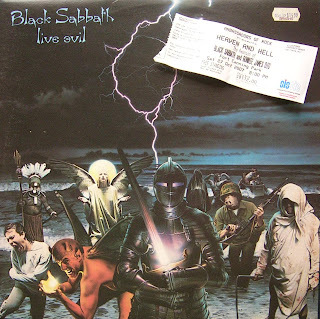 Thanks to Aat for telling me about the concert and getting the tixs..
16th May 2010 - rumours that Ronnie James Dio succumbed to cancer, but it seems he fights on.